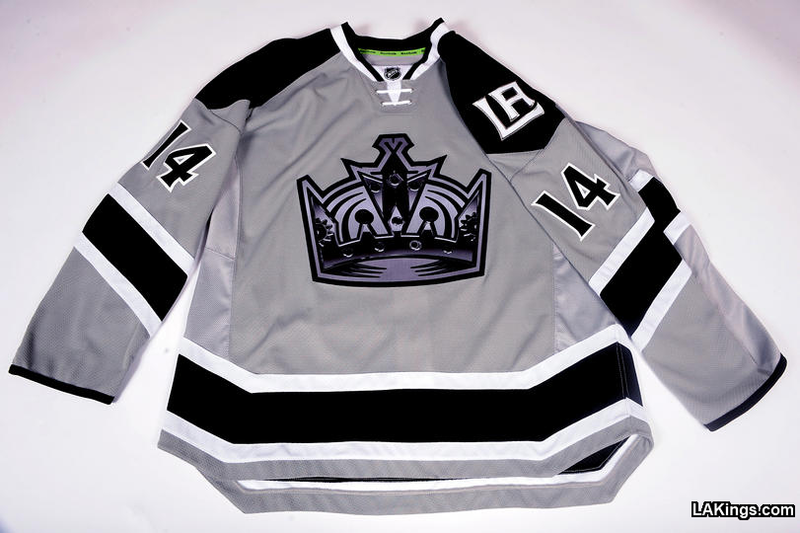 With the release of the Kings' and Ducks' Stadium Series sweaters comes a mix of elements that I really like and really don't like. This is the case with most new sweaters, but these likes and dislikes are on such opposite ends of the scale that it still clouds my judgement of the jerseys. Lets examine, shall we? I'll start with what I like. I like the yoke style. 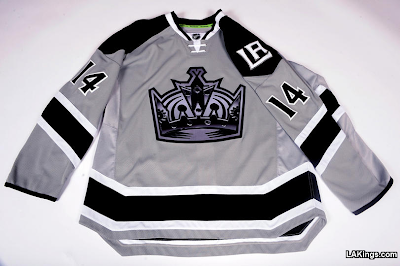 The Kings will use the same yoke that the Islanders will wear for their Yankee Stadium game. I also like the attempt at simple striping. You'll notice I said "attempt" and I'll clarify that in the dislikes section. 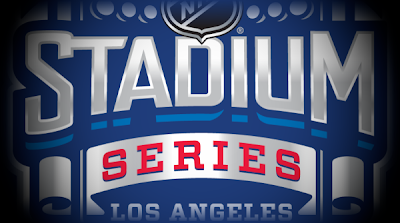 I really like the LA shoulder patch. It's a neat way to tie back to their current primary mark. 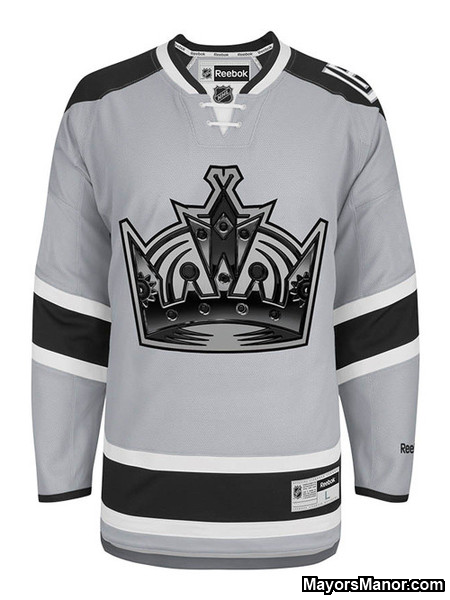 Finally, I love that this is the first grey jersey in the NHL and it works! 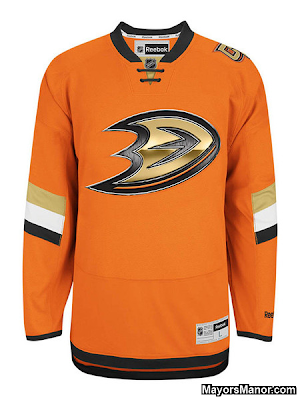 Here's what I don't like about the jersey. This new style of "backwards" lace-up collar is a nice idea, but it just seems pointless. Like black for black sake, but this is something new for something new sake. The chrome logo looks dark and comes across as a secondary element. The angled stripes and TV numbers I don't like. This goes back to the previous paragraph where I mentioned their attempt at classic stripes. We have classic stripes which have then been angled, which make it seem pointless and poorly thought out. The angled TV numbers (also on the Ducks and Islanders sweaters) just makes the jerseys a bit too gimmicky for my tastes. I like that the hem stripes go on an angle on the sides of the jersey, but I definitely don't like that the hem cut of the jersey follows the same pattern. It looks ridiculous. The angled hem stripes would have been much more effective, in my opinion, if the hem line was traditionally curved like Reebok does or a classic straight cut. Overall the jersey works and look good. It's not great, but it acceptable for what it is and what the designers were trying to accomplish. I like that this sweater is orange and that there's a lot of orange. Unlike the Kings' jersey, the chrome logo really works here. I like the OC (Orange County) shoulder patch. It's something new and fun and it works in this one-off situation. I like the simple stripes on the arms, but I want more. I want more of those stripes. I want them to go all the way around the arm. I want to see them on the hem too. They could even be angled, but in the style of the Mighty Ducks jerseys. The angled TV numbers still bother me as does the new style lace-up collar. 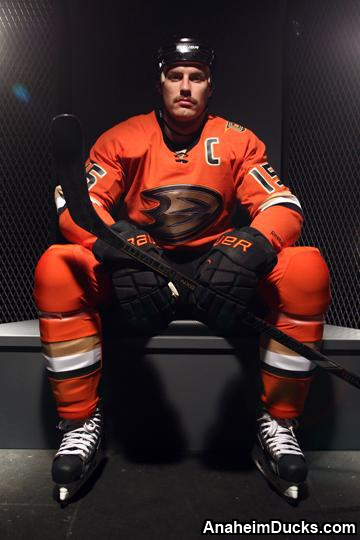 The thing that I don't like the most about this jersey is how it looked on Ryan Getzlaf (tight, and not in the way the cool kids say it) and that the Ducks provided perhaps the worst new sweater photo gallery ever on their website. The jersey has a lot of unrealized potential. It almost looks like Nike started the design and the Reebok came in and tried to do the best they could cleaning up Nike's mess. 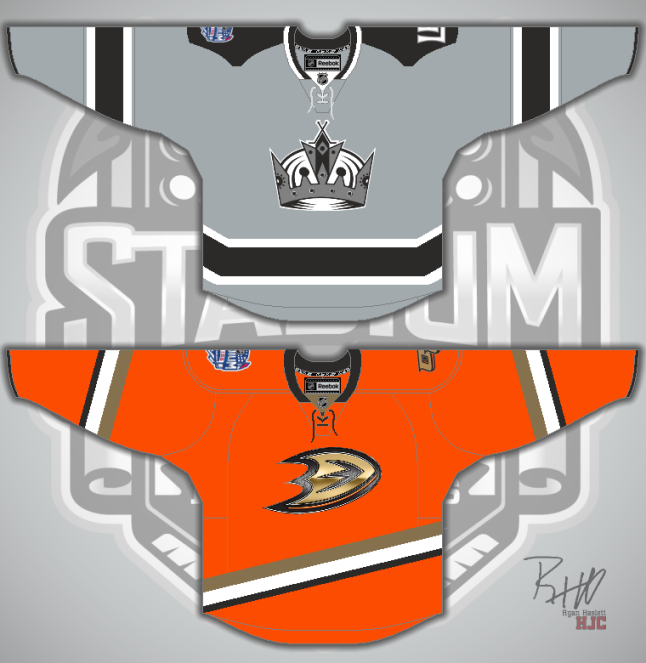 I'll update this post later with an idea of what I would like the jerseys to look like.